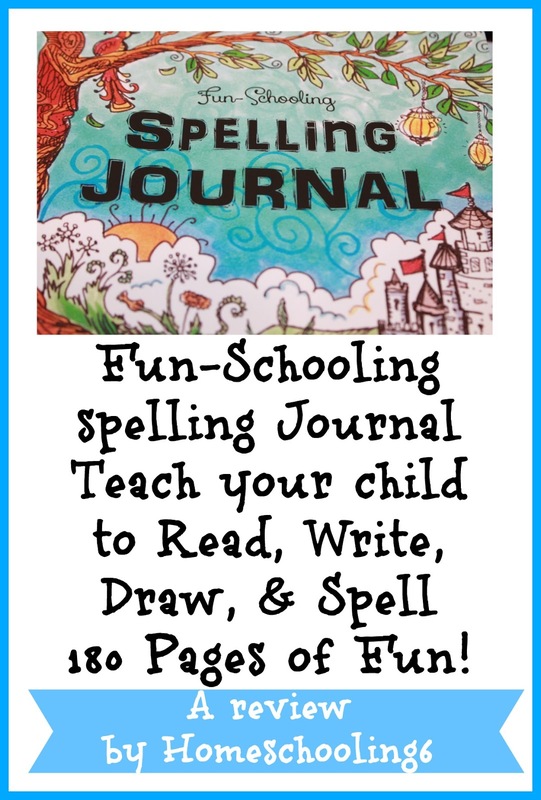 This weeks spotlight is the Fun Schooling Spelling Journal. If you have a child that struggles with reading, is a poor speller, has ADHD, and/or Dyslexia, then you might be interested in trying this Fun-Schooling Spelling Journal with your child. I've been on pins and needles with wanting to share this one with you all! It's so pretty and fun looking. It's one of The Thinking Tree's newer journals. I know I write that a lot (newer journals) but Sarah the author of these amazing books has been cranking these out so fast I can't keep up. I still want to spotlight her winter, spring, autumn, and summer journals but haven't yet (so stay tuned, they are fun and gorgeous!). Two of my boys will use next year (which is only week away). They probably won't start this journal until March. They are still using Dyslexia Games so I think I'll wait a little longer with having them use this one (it will be hard though). I love the uniqueness of this spelling journal. It's so different from what we've used in the past. The way children are taught to spell using this fun journal is great for visual learners and especially wonderful for children with Dyslexia, ADHD, and/or with Asperger's. The first five lessons have you read a fun poem to your child. You then have your little one repeat the poem until he can read or recite it all by himself! Depending on the age of your child these pages can be completed in one sitting or take a few days. Have fun going over the poem, coloring, adding some doodling, and filling in the blanks. The way I plan to use this with Lance is to say, "Cook, c-o-o-k, cook" and/or, "What do you notice about cook, look, and book?" The next few pages are Bake & Spell, totally cute! What child doesn't like sweet things to eat like cupcakes, actually my Lance doesn't like cake! Can you believe that? I think it's more the frosting than the cake though. The first page has a fun poem for you to read to your child. Like before read it and have your little one repeat the words. The next Bake & Spell page (shown below) has words to be colored and more fun cupcakes. Eventually the child will fill in the blanks to the Bake & Spell poem. 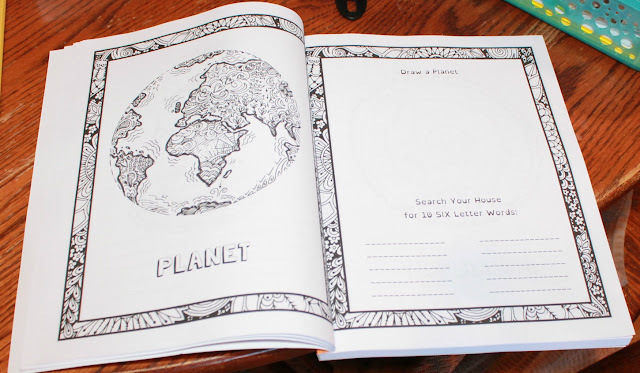 The next 30+ pages has your child draw and search around the house for words. Sometimes your child will be asked to find words with 3, 5, 7, or even 10 words! Once your child finds and writes the words have him/her read them to you. If the child copied down a word wrong, don't cross it out or put an X on it. Simply say, "This word is spelled _____" then praise your child with how well he did. If you prefer to have your child read the word she found before writing it in her Fun-Spelling Journal you can do that too, as long as you are keeping it fun. You want your child to be in a stress free environment when using the Fun-Schooling Spelling Journal. The next pages brings some of your child's creativity out with words they pick to describe a picture. I plan to sit with my boys or be near and help them spell words if needed. One thing that author encourages us mamas is to NOT make marks and corrections in THEIR spelling journal. I think these pages are going to be interesting. I can't wait to see what words my kids use to describe the pictures! With all the fun spelling practice your child's next fun-spelling stop will be to make some comic of their own. I can already see lots of LEGOS and Batman comics going on here at Homeschooling6. There are 20+ pages for your child to be creative with making their own comics. If your child grows tired with the comic pages have him alternate with the alphabet pages. One day complete a comic page the next day an alphabet page. I might have my boys copy a favorite comic from a library book or magazine. Your child will go through the alphabet making words. Once your child completes these pages, they'll have written words from a-z. The next set of pages are a bit more challenging because they will use EVERY letter in the alphabet to make ten words, wow! I can see little thinking gears turning with using these pages all ready. Once they've completed all those fun spelling pages they'll be ready to write some fun stories. As your child writes stories remember NOT to mark his book. Instead as you find words through his writing that he's having trouble with, use the My Fun Pages to help with words he misspells. Have your child practice writing the words using different color pens or colored pencils. You can have him write it in puffy letters and color them in. Be creative and keep it fun. The Fun-Schooling Spelling Journal is recommended for ages 5 and up. I will be using this my 11 and 13 year old boys who struggle with spelling. I think it's going to be a fun way for them to learn how to spell. And that's another Thinking Tree Thursday Spotlight!!! If you have a Thinking Tree or Dyslexia Games post feel free to leave a link in the comments. I'll be starting a Thinking Tree Thursday link-up in January but for now please leave a link in the comments. This looks really fun!! I love all the fun ideas, something different from the same old, same old when it comes to spelling! Exactly, no boring list when using the Fun-Schooling Spelling Journal. That's the beauty of homeschooling, we make the curriculum work for us. I can't wait to get my boys started. Thanks for linking your review! I have got this for my 7year old son and like you I'm working through Dyslexia games. Really can't wait to start it. My kids are loving Sarah's books they are amazing and fun!!! I love her books tio. They give our kids a creative way to learn. This is on my prayer list for the coming semester. Out of my two littles, I have a natural speller and my other one struggles. ((praying)) I do appreciate all that you share to help me with the decision process. Thank you!!! I love sharing The Thinking Tree journals with you all. Annette is a natural speller but not my boys. Praying this will help. I can't wait to have them start using it. We still need to finish Dyslexia Games though. Thank you for adding your link. This book looks wonderful. It would be a great addition to the games we are currently using for spelling.